Blockchain is an innovative technology which potential is much greater than the exclusive provision of Bitcoin or broadcast transactions. This technology is used in all sectors of the global economy - from retail sales and logistics to medicine and data storage. At the same time, the most popular application area of the blockchain is the banking sector. - create new models of financial interaction. All this gives a huge competitive advantage that simply can not be ignored. Therefore, almost all large banks either implement the blockchain, or are exploring this possibility. Next, we look at ten examples of how to use the blockchain in the banking sector. With cases, statistics and infographics. As it is. When a Bank of America customer wants to send money to a JPMorgan Chase account, he must pay an additional 1–10% commission. This money will be used to pay for banking services to secure the transaction and guarantee the authenticity of the money. In this case, the transfer may take up to 3 banking days. In the case of cross-border transactions, you need to pay more. So, if you work in New York and want to send part of the salary to your family in London or Paris, you will pay the same 1–10% commission plus 5–7% additional fees for transferring dollars into pounds sterling or euros. This operation will require from 3 to 5 banking days. What the blockchain will give. According to research by consulting company Accenture, the use of the blockchain in payment transactions will allow banks to save up to $12 billion a year. In particular, they can implement the Lightning Network technology, use a low-commission cryptocurrency, or develop a payment system with free transactions. Banks can use these options or create their own to reduce the cost of money transmissions and increase the speed of transactions. Moreover, it is much easier for them to do this than for the other market participants, since banks already have the appropriate infrastructure, a large client base and free capital for investment. Cases. In 2016, the FRS, together with IBM, began using the blockchain to increase the security of financial transactions and reduce their cost. In the same year ended tests of the blockchain R3 (Corda), developed by request of the consortium R3 CEV LLC for similar purposes. The R3 consortium includes more than 70 major banks and financial companies, including Bank of America, Goldman Sachs, National Australia Bank, JPMorgan Chase, Morgan Stanley and others. In April 2018, Batavia’s blockchain trading platform, developed by UBS based on IBM Blockchain technologies, conducted the first two cross-border transactions: the sale of textile raw materials for furniture production from Austria to Spain and the sale of cars from Germany to Spain. During the pilot launch, the Batavia network established a connection between all counterparties (buyers, suppliers and banks) who participated in the transaction. As it is. As practice shows, the lack of transparency in the banking sector leads to various abuses on the part of the bank or its individual employees, which can lead to both financial losses for clients and full-scale economic crises. The most striking example is the case of the American investment bank Lehman Brothers. In 2007, the bank boasted revenues of $19 billion and a record net profit of $4.3 billion, which did not prevent its management from declaring bankruptcy a year due to the inability to pay creditors of 613 billion dollars. Another example is the Wells Fargo bank. For several years, its employees opened more than 2 million fake accounts in the names of bank customers in order to improve their reporting and thus receive bonuses. At the same time, customers whose data were used suffered damage in the form of millions of dollars of illegal fees and bad credit history. What the blockchain will give. The reputation of Wells Fargo has suffered greatly, perhaps even irreparably. And if the bank’s management wants to restore customer confidence, they need technology that will ensure transparency and traceability of funds, as well as increase the protection of personal data. That is, they need a blockchain. On the basis of this technology, you can create a system that will be both open and reliable. Like, for example, in the Bitcoin payment system, where anyone can check the transaction history of any user, but no one has the opportunity to find out anyone’s personal data - they are simply not in the Bitcoin blockchain. Cases. In October 2017, JPMorgan and 75 other banks began testing the Interbank Information Network, or IIN (a blockchain analogue of SWIFT). IIN is a Quorum blockchain-based system that provides maximum transparency of banking operations for all market participants. - reduce the number of facts of fraud and theft of personal data. As it is. Any breach of contract costs money, because even if a lawsuit is won, a lawyer must be paid, and there is a chance that it will be quite a lot of money — 25–40% of the amount won during the lawsuit. If the case is lost, then you will not only have to pay a lawyer, but also pay legal fees and pay compensation. According to the US Chamber of Commerce, the gross value of commercial claims in a country settled through legal proceedings is about $300 billion ($870 billion for the whole world). And this is only direct costs. Given the hidden transaction costs, this amount will rise to several trillion dollars. What the blockchain will give. The use of smart contracts instead of traditional contracts will protect all participants in the transaction, since money or other valuables during the execution of the contract will be placed on escrow and will be released only after all the conditions of the transaction embodied in the self-executing computer algorithm are fulfilled. Cases. In 2016, JPMorgan and EthLab announced the launch of the private blockchain Quorum. It is based on smart contracts with an escrow, which can be used to transfer money, ownership and tokenization of valuable assets. Quorum is now used for payment transactions and tokenization of gold bars. In the first quarter of 2019, SWIFT plans to use Quorum to launch the new GPI payment system. As planned by the developers, GPI will accelerate payments, make them more transparent and cheaper. SWIFT also intends to use smart contracts to eliminate payment delays associated with bank errors (each tenth payment made by SWIFT contains such errors). As it is. Banks use private data warehouses that interact with other banks' storages only at the surface level and at the same time generate a lot of errors and inconsistencies. This is due to both the human factor (the clerk entered the data incorrectly) and the incompatibility of data storage formats. What the blockchain will give. Deloitte estimates that sharing information via the blockchain will allow banks to reduce more than 25% of their operating expenses for data storage and processing. In addition, it will increase the safety and reliability of stored information. Cases. In April 2018, Bank of America filed a patent application, which describes a blockchain-based system that will capture and identify personal and business data, provide access to them only to authorized parties, and keep records of all who accessed the data in the storage. In addition, platforms such as Oyster Protocol and the InterPlanetary File System can be used to store information based on the blockchain. But these solutions are not sharpened by the financial sector. These are just cloud storage based on the blockchain. As it is. Financial operations in the network are impossible without an identity verification procedure, which, although it takes a couple of minutes, but requires repetition with each operation or authorization in the payment system. It does not like users, increases the risk of data theft or money and just inefficient. What the blockchain will give. Firstly, the verification procedure needs to be completed only once to create an identification card (certificate) and then use it with each subsequent identification, verification or authorization. Secondly, users will be able to choose the method of identification and the one with whom they agree to share their identity. Thirdly, personal and financial data of users will be protected as much as possible, since the second party will not see them - the data are checked by a smart contract. Cases. Fintech startups such as Tradle, Cambridge Blockchain and ID2020 are working on personal identification. The first two projects were created to store evidence of identity verification and to provide full ownership of the data created during the identification. ID2020 is focused on issuing digital IDs to people who do not have paper IDs. He is supported by Accenture, Microsoft and the Rockefeller Foundation. As it is. We are talking about loans that are provided to borrowers by at least two lenders (lenders syndicate). And since more than three parties are involved in the syndication process (usually 10 or more), processing and issuing loans can take up to 19 days. The delay is due to the need to comply with the Banking Secrecy Law (BSA) and the fight Against Money Laundering (AML), as well as with the KYC procedure. What the blockchain will give. Using the blockchain's decentralized ledger, banks in a syndicate can distribute tasks related to local matching, KYC or BSA / AML, and link them to a single customer account. This will speed up the process and make it cheaper for all parties. Cases. In 2016, R3, Symbiont, Ipreo and Credit Suisse successfully launched a pilot launch of a project related to the use of blockchain technology in the syndicated loan market. In April 2018, BNP Paribas, State Street, BNY Mellon, ING, HSBC and Natixis teamed up to take part in the deployment of the Fusion LenderComm blockchain platform, which is focused on issuing syndicated loans. As it is. The cost of maintaining financial statements in the industry is huge: almost 40% of financial companies spend at least $ 40 million on regulatory reporting, the rest from 5 to 30 million dollars. At the same time, 60% of financial companies are confident that this year they will spend more on these processes than in 2017 (53% last year). What the blockchain will give. A blockchain-based book with unchanged and therefore trustworthy figures will allow you to safely share regulatory reports. Smart contracts automate many things related to the filling and certification of documents, which will increase the efficiency of the process, reduce time and money costs. Cases. In August 2018, the American Association of Insurance Services (AAIS), together with IBM Blockchain, presented the openIDL platform for automating regulatory insurance reporting. To automate the maintenance of regulatory reporting in the ICO sector, you can use the iComplyICO platform. As it is. On average, the costs of financial companies for the KYC procedure are $48 million, banks - $70 million, companies with incomes above $10 billion - from $150 million. At the same time, the KYC procedure takes an average of 26 days, and users should undergo it every time they “get acquainted” with a new financial company or bank. What the blockchain will give. It can become the gold standard for storing users financial and personal data, including information about the origin of money, business interests, as well as financial transaction history and the like. Banks and other financial institutions will be able to use this information to speed up the KYC procedure and store the appropriate certificate, which will be valid for subsequent checks. Cases. You can obtain a certificate of completion of the KYC procedure on the Deloitte and KYC Chain platforms. As it is. In 2012, HSBC was fined $1.9 billion after it was determined that it laundered $ 881 million for drug cartels. In 2017, Deutsche Bank was fined $630 million for assistance in laundering and withdrawing $10 billion from Russia. CBAUF paid $530 million after admitting that it did not comply with laws aimed at countering money laundering and terrorist financing. This list can be continued for hours and hours. What the blockchain will give. The introduction of blockchain-based book of accounts will facilitate compliance with AML / CTF requirements for honest banks, as well as speed up and cheapen the investigation of potentially corrupt individuals and institutions. And since the data in the blockchain is distributed over hundreds and even thousands of nodes, it is almost impossible to delete them or “correct”. - Elliptic — real-time cryptocoins origin tracking. - Chainalysis — tracking operations between cryptocurrency addresses. - CoinFirm — money tracking through blockchain-based transaction verification. As it is. 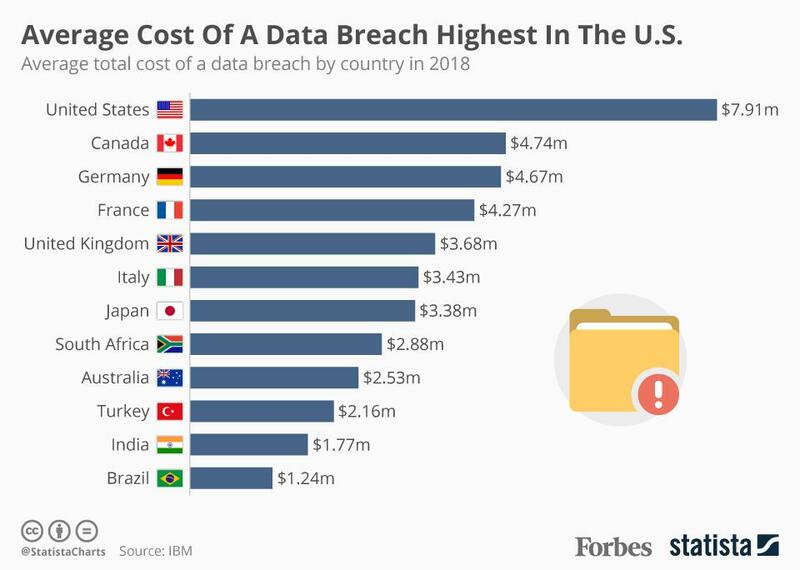 A global research Cost a Data Breach, sponsored by IBM, showed that financial companies lost $ 3.8 billion in 2018 due to leaks of personal and business data. The average cost of each stolen or lost record that contains personal and / or confidential data was $148. At the same time, companies providing financial services are victims of cyber attacks 300 times more often than companies in other industries, since here it is easier to get direct access to users' money. As a result, banks and other financial companies are forced to invest incomparably large amounts in ensuring the safety and reliability of their services. What the blockchain will give. Security and authentication tools based on blockchain technologies will give more chances to detect and block malicious attempts to get data through black holes. Due to this, banks will be able to save on the costs associated with data leakage, and raise the level of customer confidence in their structures. Cases. In May 2017, JPMorgan announced its intention to integrate Zcash into its Quorum platform. Zcash is a cryptocurrency created by the Zerocoin Electric Coin Company to ensure confidentiality and selective transparency of transactions. In May 2018, Bank of America filed a patent application, which describes a system using blockchain-based security tokens to tokenize valuable assets.